Batteries are the driving force behind your vape mod, but they’re also a potential source of trouble if you’re demanding too much from them. When you’re using standard atomizer or tank, the reasonably high resistances mean that battery limitation aren’t much of a concern at all, but if you start building your own coils, particularly at sub-ohm (< 1 ohm) resistances, the continuous discharge rating of the battery becomes pretty important. In most cases, you’ll be using an 18650 battery, and the usual 10 A rating will be more than adequate. Using ohm’s law (I = V/R, or amps = voltage/ohms), you can see that even for sub-ohm builds of 0.7 Ω, 4.2 V would lead to 6 amps of current, which is still within the capabilities of most large batteries. However, if you start going any lower, you’ll be approaching your battery’s limits, which isn’t a wise move given that the maximum continuous discharge ratings can be somewhat exaggerated. That’s why it’s better to get a seriously capable battery if you’re venturing into very low resistances. There’s a useful guide on Kritikal Mass showing the safe operating resistances for various batteries, and similar info is also available elsewhere. IMR batteries are lithium-manganese, which is a safer-chemistry option that prevents the more violent consequences (venting with flames or explosions) in the unlikely event that you do have problems with your battery. The AW IMR 18490 is the only non 18650 vape battery on the list, but if you’re using a mod that doesn’t take 18650s or allows you to use anything from an 18350 upwards, the 16.5 A rating on this makes it a pretty good option for low-ohm building. Plus, AW batteries have a very good reputation, usually coming highly recommended regardless of size. These vape batteries are being discontinued, but are still available until suppliers exhaust their stocks, and the high maximum continuous amp-rating and solid performance of these batteries generally means they come highly recommended by vapers. They’re currently available at Avid Vaper and some other suppliers, but they don’t last quite as long as other options in tests at a continuous amp draw. Samsung's INR 18650-20R is a hybrid style vape battery (LiNiCoMnP chemistry), which basically combine the safer chemistry and extended capacity technologies to produce something that gives the best of both worlds. In this case, the 22 A maximum continuous discharge rating puts it well above most 18650s, and the capacity means it performs pretty well in terms of battery life too. At 10 amps (which is higher than is recommended), it lasts longer than the vast majority of 18650s available, but there are better options if you don’t draw quite so much current. There's also now a newer version (the 25R) available too. It might not have the highest continuous discharge rate, but the LG IMR 2500 mAh stands out because of the excellent capacity. Although they’re listed as IMR, some refer to them them as ICR (lithium cobalt chemistry), but they’re actually hybrids, thus explaining the much greater capacity provided. There’s also some dispute about the maximum continuous discharge, with some retailers listing as high as 35 A. This is a pulse rating (and an exaggerated one at that), so it’s the continuous, 20 A rating that you really need to pay attention to. Still, you’re unlikely to run into issues with this unless you’re working with very low resistance indeed. This battery has been updated to the HE4, although this newer version has the same specs. AW IMRs vape batteries are widely recommended, and the 1600 mAh option is the highest maximum discharge rated one available, making it a favorite for vapers looking for a large amp draw over maximum capacity. There’s a AW IMR 2200mAh version, but the maximum amp-draw on this drops to 20 A. The larger capacity option lasts longer, but the comparative performance and lifespan of the 1600 mAh version does improve when tested at 5 or 10 A. It’s not the perfect battery if you’re considering maximum amp draw, but its quality and reputation for safety means it’s still recommended alongside some of the higher-drain options. Another safer chemistry option, but this time packing a 30 A maximum continuous discharge rating, meaning its right up there with the best amp-ratings you can find in an 18650 battery. The EH IMR 18650 NP is made by Sony, so you can rest assured you’re getting high quality (rather than a second-rate battery brand like TrustFire), and the capacity is a touch higher than many high amp-rated batteries, so it’ll stay above 3.7 V for longer than much of the competition. It’s a great option for mech mod users, and there’s also a 1500 mAh version that provides a respectable 22 A.
Efest is one of the most well-known vape battery brands among vapers, but they aren't the most reliable when it comes to maximum amp limit ratings: this battery is advertised as 30 A, but it doesn't perform well above 20 A. The 1600 mAh option is still the best for sub-ohming from the standard range of red batteries, but they also have some lower-drain options (2000 mAh IMR or 2250 hybrid) offering the more ordinary maximum of 10 A. Direct testing from Sun Vapers shows that it doesn’t do quite as well as Sony’s US18650VTC batteries, but it’s still a great battery overall. The Orbtronic SX30 provides a great mixture of maximum amp-load and capacity, and the SX22 is also a good offering, at 22 A maximum and 2000 mAh capacity. Testing on Orbtronic batteries generally shows excellent capacity, as is expected from batteries using hybrid chemistry. Some other Orbtronic batteries are just repackaged Panasonics, but in any case you’re getting high-quality, Japanese-made, dependable batteries. Pushing both the maximum amp-load and providing a notably high capacity, the new purple-coated options from Efest are IMR batteries (Li-Mn), with options advertised as 35 A and 30 A (2100 mAh) available. However, the stated amp ratings are actually maximum pulse discharge ratings (they're both really 20 A maximum continuous discharge), but the increased capacity puts it a step ahead of the competition in terms of wiggle-room. The Sony US18650VTC 3, 4, or 5 all provide a maximum continuous discharge of 30 A, making them an ideal option for mech mod users who want to delve into super-low-ohm builds, but their capacities differ. The VTC5 battery has the longest lifespan, but the 2100 mAh of the VTC4 and the 1600 mAh rating of the VTC3 are still right up there with the competition. They use hybrid chemistry, so you get the protection from the safer chemistry with the added boost to the capacity that means you can vape for longer. 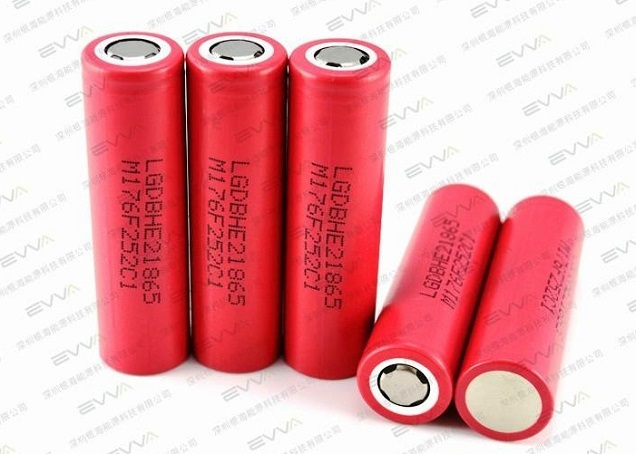 The 10 A limit is fine for most vapers, but if you want to pull more current for your sub-ohm builds, there are a wealth of 18650 battery options available. Opinions may differ on their performance, and on individual manufacturers’ products, but the 30 A limits widely available mean that you can get to a pretty low resistance and still be far from the maximum current draw. It’s best not to push it close to the limit (manufacturers generally quote idealized figures, so it’s not worth risking), but with such high limits it really isn’t necessary. If you’re unsure about what you’re asking from your vape battery, all you need is Ohm’s law or a handy vaping power calculator – it’s better to double-check first than put too much stress on your battery in the everlasting quest for bigger clouds. Regardless, using a bigger, more capable battery is one of the best ways to stay safe when you’re sub-ohming, even if you’re highly unlikely to approach a limit.